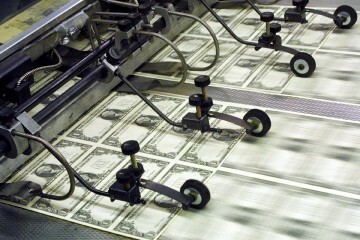 Papering over U.S. debts and trade imbalances will take more bills than we can print. The Economic Crisis We Endure Today is only the latest chapter in the century-long struggle to restore financial order in world markets-a struggle whose outcome is inextricably bound up with U.S. prosperity and the promise of the American way of life. The monetary disorder and national currency wars of that era are now being repeated in our own time, and have again led to social disorder and pervasive civil strife. I cite only one example among legions. The recent “Arab spring,” a revolutionary upheaval of the suppressed Islamic poor and middle class, was triggered by a vast food and fuel inflation, transmitted to the dollarized world commodity markets by hyper-expansive Federal Reserve monetary policy during 2008-2011. Huge price increases for basic necessities penetrated into the heart of all subsistence economies-in this case, North Africa. Because the dollar is the official reserve currency of the world trading system, when the Fed creates excess credit to bail out the banks and the U.S. government deficit, it exports some of the excess liquidity abroad, igniting basic commodity inflation and the social strife this engenders. At home, the same rising prices of food, fuel, and other basic needs impoverish those on fixed incomes. Moreover, they lower the standard of living for the middle class, held back by wages and salaries that always lag rising prices. Even more ominous, the surge of contemporary mercantilism and competitive currency depreciations- initiated by monetary authorities worldwide- brings to mind the national rivalries among the Great Powers between World War I and World War II. Amidst financial disorder, floating exchange rates, and beggar-thy-neighbor policies during the interwar period of 1918-1940, civilization witnessed the rise of imperial Japan, Mussolini, and Hitler. But the 1920s had begun with great hope, including overwhelming confidence in the primacy of central banking, led by Benjamin Strong of the Federal Reserve System and Montague Norman of the Bank of England. The unrestrained boom of the 1920s, rising on a flood tide of central bank credit-based on the reserve currency role of the dollar and the pound- led to the brief illusion of permanent prosperity. That “new era” ended in austerity, currency chaos, autarky, depression, and world war. Thus, it becomes in creasing ly urgent, if we might learn from the past, to restore international monetary order now, with reforms to re-establish a stable dollar and stable exchange rates. The United States is still able to set the example for the world to emulate. Indeed, the major powers publicly endorse international monetary reform. All seem to sense that only with stable exchange rates can the world trading community rebuild global incentives for equitable, balanced, and growing world trade-and, with these incentives, create the conditions for global growth and rising standards of living. NOW COMES THE PERENNIAL QUESTION: How, precisely, does the United States once again establish a stable dollar? How do the United States and other countries get from “here” to “there”- that is, from the anarchy of floating-paper currencies to stable exchange rates based on an impartial, nonnational monetary standard? These questions have been debated at crucial junctures over the last century: before and after the creation of the Federal Reserve System in 1913; after the catastrophe of World War I; after Franklin Roosevelt in 1933 expropriated and nationalized all American citizens’ gold holdings; after Richard Nixon severed the last weak link between the dollar and its gold backing in 1971. Recently, the same debate intensified after the Great Recession of 2007-2009, marked as it was by wild exchange-rate and currency instability. But it was the vast, inequitable financial subsidies-provided by the Federal Reserve system and the United States Treasury to an irresponsible, often insolvent, and cartelized world banking system-that sparked national outrage. In free markets, with responsible agents, insolvency should entail bankruptcy. Those who earn the profits in a free market must themselves endure the losses. Without the discipline of bankruptcy, crony capitalism must result-with the taxpayer providing the subsidies. What lessons might we learn from American financial history? Consider the fact that from 1792 until 1971, the dollar was defined in law as a weight unit of gold (and/or silver). The last vestige of convertibility of the dollar into gold was abolished by President Nixon’s executive order on August 15, 1971. Since then, the dollar has depreciated dramatically, to the point that it is now worth a mere 15 pennies, adjusted by the CPI. After generations of manipulated paper- or credit-based floating currencies-which ignite the currency wars of our own era-it has become increasingly clear that free trade without stable exchange rates is a fantasy. It is true that the post-World War II dollarized Bretton Woods system, inaugurated in 1944, gave rise to a new era of free trade; but it was free trade maintained and subsidized by the especially open market of the United States. After World War II, the United States controlled 50 percent of world output. Thus, the U.S. dollar became the sole acceptable reserve currency with which to conduct international trade- displacing gold by international agreement at Bretton Woods. The Bretton Woods system caused the dollar to become substantially overvalued as a result of worldwide excess dollar demand for transactions and foreign official reserve holdings. The overvaluation of the dollar was intensified by post-World War II currency depreciations and inflationary fiscal and monetary policies of other major countries. The European currencies were finally stabilized and made convertible on current account in 1959 through the monetary reform of the European Payments Union. But the dollar remained overvalued as the sole official reserve currency of the Bretton Woods monetary regime (of 1944-1971). Overvaluation of the dollar was compounded by excessive Federal Reserve money expansion within the pegged currency system of Bretton Woods, thus systematically raising the cost and price level in America relative to other major countries. This happens because the Federal Reserve creates money to purchase Treasury debt securities, a process which finances the U.S. budget deficit. But the newly created money On behalf of Treasury spending is not associated with the production of new goods. Thus total demand exceeds total supply at prevailing prices. Prices rise (inflation), followed by rising costs. American goods thereby become incresingly uncompetitive in world markets. After the collapse of the dollar-based Bretton Woods system, floating-pegged exchange rates ensued (1973-2012). Compared to the U.S., both developed and developing countries to this very day have aggressively protected their markets with undervalued currencies, quotas, high tariffs, and discriminatory regulations- China most egregiously in recent years, Japan earlier. This arrangement has characterized the world trading system not only under Bretton Woods but also amidst the floating-pegged currency arrangements of today. Successive American administrations, all committed to free trade, have made the U. S. open market an easy target for mercantilist nations worldwide. The good intentions of American free traders have never been fully reciprocated. As a result, developing countries have mobilized undervalued currencies with which to build growing export machines, and without giving commensurate trade reciprocity to the United States-the General Agreement on Tariffs and Trade (GATT) and World Trade Organization (WTO) notwithstanding. has enormously impacted the United States economy. Net U.S. investment abroad is the value of assets and claims held by U.S. residents and their government abroad, minus the assets and claims foreigners and their governments own in the U. S. In 1980, net United States international investment was 10 percent of GDP. In 2010, it was negative 20 percent of GDP. The empirical data show that the entire shift from positive to negative is accounted for by the official, accumulated, United States balanceof- payments deficit. In a nutshell, since World War II, free trade has often been at the expense of United States business, manufacturing, and labor. The problem of dollar overvaluation was compounded not only by its reserve currency role, but also by the perennial United States budget deficit, increasingly financed by Federal Reserve money and credit creation. But the U.S. budget deficit is financed not only by the Federal Reserve and the banking system, but also by foreign government purchases of U.S. Treasury debt, which is held as official national reserves. China and Japan, two major beneficiaries of U.S. trade and budget deficits, hold official reserves equal to approximately $2 trillion of U. S. government related debt. The authorities, mesmerized by neo-Keynesian mythology, do not understand that the exponentially growing U.S. budget deficits absorb a huge fraction of domestic production, which would otherwise be available for export sales to the global market. Proceeds from these exports, growing faster than payments for imports, could then be used to settle U.S. balance of payments deficits, thereby reducing U.S. debt. Let us remind ourselves that after World War I, the reserve currency system, based on the pound and the dollar, was liquidated in total panic (1929- 1933) , turning a cyclical recession into the Great Depression. Today we have relearned the lesson, as expansive Federal Reserve money creation has combined with the official reserve currency role of the dollar to cause massive credit, commodity, and general price inflation worldwide. (The purchasing power of the 1950 dollar adjusted by the CPI has declined over 90 percent.) But, like Banquo’s ghost, deflation and unemployment still haunt us, despite the Greenspan-Bernanke era of quantitative easing (often known as money-printing). That is because as soon as Fed money-printing slows down, prices tend to fall, with the threat of deflation and unemployment (2007-2012) coming to preoccupy the financial authorities. The inflation-deflation cycle is systemic, caused by perennial budget deficits and unhinged Federal Reserve stop-go monetary policies. The scientific method and economic history teach us that under similar conditions, similar causes tend to produce similar effects. The saying makes the point: “History never repeats itself, but it often rhymes.” We know that reserve currency systems have been tested by the market, and that they have failed in the past (e.g., Sterling in 1931; the Bretton Woods dollar in 1971). And the timing of their collapse cannot be accurately predicted. But now is the moment to prepare a program of monetary reform. How, therefore, may America now lead other nations toward an equitable world trading system based on a balanced monetary order, a disciplined Federal Reserve, balanced budgets, stable exchange rates, and reciprocal free trade inuring to the mutual benefit of all? How do leading nations stage the resumption of a modernized true gold standard, ruling out the escalating debt and leverage engendered by the perversities of floating exchange rates and official reserve currencies? For the purpose of true monetary reform, we have an example from the only available laboratory of monetary policy: human history (surely a better source than abstract equations imported from the blackboards of Princeton or the University of Chicago). The empirical data show that the classical gold standard (1879-1914) had its imperfections, but was the least imperfect monetary system of the last two centuries, perhaps even of the past millennium. At the end of the entire period (1879-1914), the general price level was almost exactly where it began. Overall economic growth was the equal of any period since the birth of the Republic. Given the gravity of world financial disorder, America must take one of two divergent roads. She may persist on the road of soft indulgence afforded by the unstable dollar’s official reserve currency role. It is true that the absolute dominance of the dollar has gradually diminished since World War II, given the rise of Asia and Europe. Still, the world dollar standard could continue for another generation because of the scale and liquidity of the dollarized markets across the globe. Consider the extraordinary fact that almost two-thirds of world trade, not including that of the United States, is still transacted in dollars. About 75 percent of world commodity markets are still settled primarily in dollars. U.S. dollar financial markets are the repositories for as much as 5 to 6 trillion of foreign reserves, not easily invested elsewhere. In the service of unrestrained U. S. politicians, the world reserve currency role of the dollar underwrites the twin budget and balanceof- payments deficits, as well as the exponential increase of United States debt-which must lead, in the absence of monetary reform, to national insolvency. This “exorbitant privilege”-that is, the dollar’s role as the world’s primary reserve currency-does mislead American authorities, policy makers, and academic economists to persist in rationalizing the reserve currency privilege of the dollar as a boon instead of a deadly economic malignancy. On the other hand, far-seeing American leaders could acknowledge that the dollar’s official reserve currency role is an insupportable burden instead of a privilege. It is a burden because 50 years of supplying official reserves to the world necessarily entails the uncontrolled increase of dollar debt, ultimately financed by Federal Reserve credit expansion, foreign central banks, and the global banking system as a whole. Moreover, dollar deficits, monetized by the Fed and foreign banking authorities, are the fundamental cause of 50 years of global inflation. Let me repeat that the purchasing power of the post-World War II dollar has shriveled to less than a dime. Finally, the steady dissipation of the U.S. international investment position- assets and claims in other countries owned by the United States, minus foreign liabilities-has led to the decline in American international competitiveness. Recently, as much as 60 percent of the United States budget deficit has been financed by money and credit conjured into existence by the Federal Reserve. But these newly created dollars are not associated with new production of real goods and services. Under such market circumstances, total demand must exceed total supply, expressed by price increases in one sector of the world economy, such as oil and commodities (2003-2011), Internet stocks (1995-2000), or real estate (2004-2007). Fed credit expansion unassociated with the production of new goods and services-that is, the creation of demand without supply-is the hidden inflationary mechanism behind the world dollar disease. However, when the Fed tightens credit abruptly and substantially, as in 2006, the process is reversed with deflationary consequences (2007-2009). Moreover, some Fed-created excess dollars flood abroad, sustaining the perennial United States balance- of-payments deficit. But the excess dollars going abroad are not inert. They are purchased by foreign central banks against the issue of their newly created domestic money, most prominently today by China in the form of new yuan. Global purchasing power is thereby augmented in this case by new issues of yuan-also unassociated with the production of new goods. The Chinese and other foreign central banks promptly reinvest the accumulated dollar reserves in U. S. Treasuries, financing the U.S. budget deficit; these foreign dollar reserves also finance the U.S. balance- of-payments deficit and the inordinate personal consumption debt of U.S. residents. Because of the official reserve currency role of the dollar, everything carries on as if there were no United States deficits. There is little compelling incentive for the U.S. government-or its congressional budget masters, or the consumer holding the ubiquitous credit card-to adjust. In a word, the official reserve currency role of the dollar enables America to buy without paying. Worse yet, the necessary adjustment mechanism needed to rebalance world trade has been permanently jammed, immobilized. If American leaders continue to choose rising debt and deficits financed by the Fed, the reservecurrency dream world in the United States may carry on for many years before its collapse. But collapse is inevitable. The choice is ours. Indeed, this election may be our last chance. If American leaders embrace true monetary reform, they will reject the siren song of the reserve currency’s exorbitant privilege. They will acknowledge the insupportable burden of the dollar’s official reserve currency role. They will Plan now for the termination and windup of the dollar’s reserve currency role. They will plan to restore dollar convertibility, defining the dollar by statute as a certain weight of gold, and then propose gold as the missing and impartial global balance wheel by which to settle residual balance-of-payments deficits among nations and currency areas. A balanced budget amendment to the American Constitution should follow. Moreover, such a monetary order, based on convertibility of the dollar to gold, free of government manipulation, provides an indispensable rule for the conduct of the Federal Reserve System-bringing to bear rule-based market discipline to stabilize the Fed’s monetary policy. Domestically, the institutional discipline of dollar convertibility would limit the Fed’s unrestrained discretion to print money, finance the government budget deficit, and bail out the cartelized banking system. Under dollar convertibility, if the Fed creates too much money, causing inflation, the people are free to redeem currency for gold at a price set by law. Too great a loss of gold would threaten the solvency of the banks. Thus, the Fed and the banking system would be forced to reduce the growth of money and credit, thereby maintaining convertibility and containing inflation. Conversely, deflationary tendencies could be contained by Federal Reserve credit-made available at market rates on high-quality collateral- without threatening currency convertibility. To choose true monetary reform and balanced budgets is to embrace not only the American Constitution, but also the nation’s historic financial policy that led to world leadership. Article I, Sections 8 and 10 of the United States Constitution enabled the monetary reconstruction of the American Republic at the founding on the bedrock of a gold dollar. The Constitution mandates that only Congress has the power “to coin money and regulate the value thereof.” The Constitution prohibits the states from making anything but “gold and silver a legal tender.” Shorn of the crushing weight of trade disadvantages caused by inflation and the accumulating debt and deficits-originating in budgetary excess and the reserve currency role of the dollar-America could again become Prometheus unbound. American economic reconstruction, grounded by the true gold standard, would lead to a resurgence of rapid growth, empowered by renewed confidence born of market expectations of a stable long-term price level. With American leadership, other nations would follow. By re-establishing an effective and equitable international adjustment mechanism, international monetary convertibility to gold would end perennial deficits, manipulated currencies, and the threat of currency wars among the major nations. The true gold standard-that is, a dollar convertible by statute to a specific weight of gold, joined to the windup of the official reserve currency role of the dollar-would make vast sums of money available for long-term productive investment. With a stable long-term price level, speculators worldwide would abandon unproductive inflation hedges. This dishoarding would yield immense, liquid savings for productive investment in real goods and services. Equity and true capital investment would gradually displace debt and leverage. Under conditions of stable money and stable exchange rates, savings would be redeployed by entrepreneurs and investors in new and innovative plants, technology, and equipment- minimizing unemployment, as skilled and unskilled workers are hired to work the new facilities. The export production machine of the United States would be reoriented to produce for the world market, which would engage all the positive and equitable effects of economies of scale and free trade. This is the true road of American monetary and economic reconstruction. Let us begin the great work before us. * Lewis E. Lehrman is a senior partner at L. E. Lehrman & Co. And chairman of the Lehrman Institute.